Things were fine until he mentioned his boyfriend. Then the cab driver threw him out. 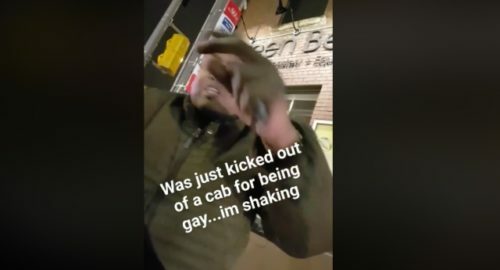 A man in Toronto says he was kicked out of a taxi because he’s gay. Travis Paul said that he was going home late after drinking with friends. He was talking to the driver and mentioned his boyfriend. Paul said that’s when the driver, Abdi Hussein, told him to get out of the car, after 2 a.m., in the rain, about half an hour from his home. “About $10 into the fare, he just kind of said, ‘You don’t have to worry about the fare,’ this is where you can hop out,” Paul said. He started recording the encounter on his phone in video that he posted to Facebook. It has since been removed. “We are not comfortable my friend. It’s okay,” Hussein said in the video. When Paul asks Hussein if he got kicked out for being gay, the driver denies it and tells Paul to leave him alone. Toward the end of the video, Hussein called the police. The police did not come and no report was filed. Hussein said that he kicked Paul out for using coarse language. “He was using the F-word 100 times. More than 100 times,” Hussein said. Hussein said that he has video of his own but he couldn’t send it to reporters. Hussein works for an independent cab company licensed by the city of Toronto. Local ordinances do not require taxi drivers to undergo any diversity training, but discrimination on the basis of sexual orientation is illegal.